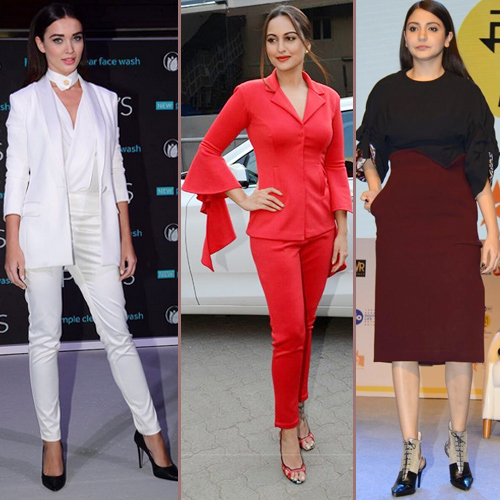 Our Bollywood divas gives you a new fashion golas for this winter. Here we have look at trendy formal wears to try this winter. She looked fabulous in Dior look. Her black top with exaggerated sleeves and oxblood pencil skirt was styled with sleek hair and lace up booties.With subtle hair and make up look gorgeous. Sonakshi Sinha wore red dress, it's look like formal. She complete her look with red lipstick and high heel sandal. She styled by Aastha Sharma. Amy Jackson look very beautiful in white formal. Brand ambassador Amy Jackson suited up in a sharp white ensemble and a centre-parted hairdo.